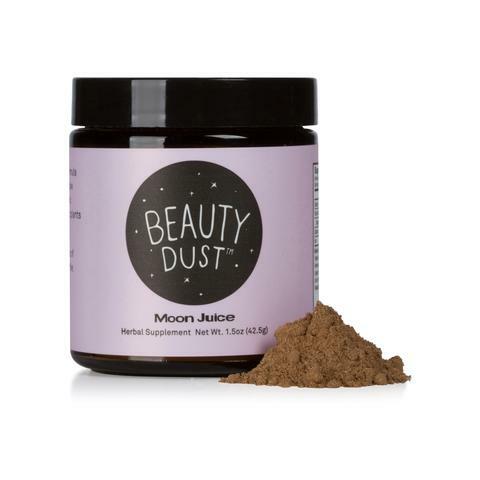 So, yeah, a cup of Beauty Dust every morning will chill the aging process and leave you with gorgeous, glowing skin. Who’s in? Here’s an exclusive Beauty Latte recipe from our friends over at Moon Juice. Wash face. Apply serum. Apply sunscreen. Drink your collagen-coffee. Repeat. This is a warm cup of luscious antioxidant, enzyme, amino, and mineral richness. This ancient beauty potion delivers deep nourishment into the bloodstream for bone and cell building and tissue regeneration, reversing the effects of aging and inflammation. It also tonifies and heals organs, beautifying on a cellular level and bringing suppleness to the skin and shine to the hair. Gently warm the Lait de Coco in a saucepan over low heat, without allowing it to simmer. Carefully pour it into a blender. Add the rose water, lucuma, pearl, schisandra, sweetener, and oil. Blend on high for 20 seconds or until warm and frothy. Pour into a mug and serve topped with the tocotrienols. Combine all the ingredients in a blender and blend until smooth, about 45 seconds. This milk will have a nice “cream on top” when cold, so shake and stir to evenly distribute. DIY: Kitchen Cabinet Hair Mask + Video!